Luxury Cabin With a Beautiful mountain View! This remarkable cabin privately situated on a wooded lot offers breathtaking mountain views. The inside is beautifully decorated with one of a kind antiques and taxidermy items that include a Black Bear. From the Chef’s kitchen with all of the amenities to the spacious living area, boasting tall ceilings and windows that bring the beauty of the outdoors inside, to the stunning gas log fireplace this cabin has it all. There is a large wood slab dining table that seats 8 and just when you think you’ve seen it all, look up, there’s a Canoe hanging from the rafters, and who doesn’t want their own Juke Box. You will be amazed at this home, is absolutely stunning! Also on the main level is a half bath with a washer and dryer. There are two bedrooms on the main level. The spacious Master offers a King Bed, a flat screen TV, its own deck access, a large bathroom with double sinks and a large rock shower. The perfect place to enjoy a good book or your first cup of morning coffee. The 2nd bedroom on the main level provides a Queen bed, a flat screen TV, deck access, a private bathroom with a single sink and a Jacuzzi Tub/Shower Combo. The main level deck offer’s seating, a gas grill, a wood burning fireplace and breathtaking mountain views. Downstairs is where the fun begins! How about a competitive game of Pool or Foosball? There is also a card table, a sectional sofa, a flat screen TV, gas log fireplace, two gaming machines, a bar, a checker’s table and so much more! Two (2) additional bedrooms complete this level. Both include a Queen Bed, flat screen TV, private bathroom with single sink and a shower/tub combo. Cable TV and Wi-Fi are also offered in this one of a kind cabin. The lower level deck offers seating, a Hot Tub, access to the outdoor fire pit and breathtaking mountain views. 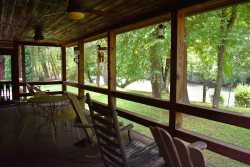 The Cabin could very well become your favorite place to be! Beautiful spacious cabin. Loved everything about it and can not wait to come back! !